Cincinnati beat maker Hi-Tek has returned with his third Hi-Teknology solo album, and while it doesn't have a nifty subtitle like last year's Hi-Teknology 2: The Chip, it does have a similarly respectable list of guest contributors. Obviously, all the production on Hi-Teknology 3 comes from Hi-Tek himself, but the album features lyrical contributions from Ghostface Killah, Raekwon, Talib Kweli, Estelle, Little Brother, Young Buck, Sean Kingston, and Tek protégé Dion (a lot). Last week, following a tip from reader Caleb Goldkamp (thanks dude! ), we started sniffing out a Built to Spill February and March tour. And then, lo and behold, the entire month-long itinerary spread out before us like a succulent holiday feast. These guys sure love the road, don't they? Is it me, or are charity swag auctions the new childrens' indie rock comps? Remember when you couldn't do a cartwheel without landing on one of those things? No complaining though-- while the merits of the latter are debatable, you can never have enough good deeds. And all that's to say that the Cure are the latest act to contribute to a charity auction. Robert Smith and his gloom patrol have lent an extra special guitar to a cause of a different sort. They join Henry Rollins, Metallica, Eddie Vedder, Steve Earle, and other outspoken supporters of the men believed wrongfully accused in the hotly-contested West Memphis Three murder case. Proceeds from the auction will go the West Memphis Three's defense fund. 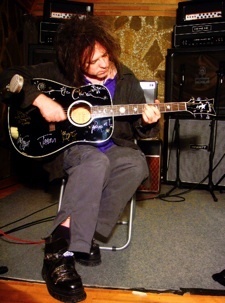 The six-string up on the auction block is a Schecter RS-1000 acoustic (pictured), custom designed according to Smith's specifications, put to use in the studio this year, and signed by Smith and the other three present members of the band. Place your bids beginning tomorrow (December 11) via Skeleton Key Auctions or the Cure's website. The auction closes Christmas Day. As you may know, popular rapping group Wu-Tang Clan have a new album called 8 Diagrams coming out tomorrow, December 11. And while the whole crew will kick off their winter tour (now with more dates!) this weekend, Wu sonic mastermind RZA will play a few solo shows even sooner. RZA's tour starts tomorrow in San Francisco, with four stops in California and one in New York City. He'll be backed by the live band Stone Mecca on all dates. Thanks to the strike, tonight we get to take a time machine back to 2004, when Liz Phair played "Leno". UK dubsteppers Various Production have ended their business relationship with XL and ushered in a wave of typically vague new release news in the process. Various wasn't technically signed to XL to begin with. Instead, the group licensed XL the release of The World Is Gone from its own Various imprint. Despite the seemingly relaxed nature of the arrangement, both parties have reached what a press release calls a "mutual decision" to part ways, and that's about all the juicy insight we have into the split. This means the ball is in Various' court when it comes to releasing their second album. Might we suggest perhaps "doing a Radiohead"? We hear it's all the rage. However they release it, the currently untitled album will come out next year, but a bunch of other Various miscellany (redundant?) comes first. There's the remix of Ian Brown's "Sister Rose" that's out now. Then, a Christmas bundle with a 12", USB bracelet, and t-shirt comes to the UK on December 17 via a newly formed imprint called Misc001. Finally, Various' album-length collaboration with Glaswegian poet Gerry Mitchell-- not to be confused with Various' second album-- will see release next year. Surprise! Warp knob twiddler Clark has a new album coming out January 28 in the UK called Turning Dragon, and he's already released an EP to promote it. The EP is called Throttle Promoter, and you can pay for the download (alas, no doing of any Radioheads with this one) here. There's a vinyl version available now as well. As for the sound of the new album, Clark says, "Alongside Body Riddle I'd written a lot of full energy dancefloor tracks, and Turning Dragon just came from honing and building on these." IDM dance party, anyone? With all the solo love Jeff Tweedy's been giving his hometown recently, Wilco's recently announced 2008 U.S. tour looked a little strange without a single date in Chicago. The band has remedied that situation, however, with a five-show residency at Chicago's Rivera Theatre, which will kick off the tour in mid-February. According to a press release, the residency is "five shows exploring the band's complete recorded works," and Tweedy had this to say about it: "Over the five nights we will attempt the 'complete Wilco' and try to clear out the dusty corners of the catalog that we haven't attended to in a while." Allow me, if I may, to blow your mind just a smidge: 13 Blues for Thirteen Moons, the forthcoming LP from Thee Silver Mt. Zion Memorial Orchestra & Tra-La-La Band, doesn't start with Track 1 like, uh, every other album ever. No, 13 Blues begins at Track 13, fittingly. (The first 12 tracks are brief continuous drones.) An unlucky omen from the post-rockers, or just a way to confuse the heck out of your iPod? You'll find out March 25, when Constellation Records releases the album on CD and 180- gram double-LP. 13 Blues was recorded at Montreal's Hotel2Tango studios and co-engineered by ex-Arcade Fire drummer Howard Bilerman and Silver Mt. Zion's live soundman Radwan Moumneh. It's also the band's first LP to feature former Hangedup drummer Eric Craven behind the kit, and the first to include a lyric sheet. Guess Efrim Menuck doesn't mind us knowing what he's singing about this time out. The band also has plans to tour in 2008. The morbidly named, Louisville-based metal fivesome has signed to Touch and Go subsidiary Quarterstick for the release of its debut full-length next year. Titled Attack, the record will come out on April 8. The past year or so has been quite kind to Chan Marshall. Since releasing The Greatest in 2006, the artist better known as Cat Power has seen her act get cleaned up, her star rise considerably, her fanbase swell, and her record receive accolades left and right. So now, guess what? It's time to give back. JUST DO BASIC TRAVELING TO 'FIND' NEW PLACES FOR WELLS. Charity: lists among its goals "stimulating greater global awareness about extreme poverty, educating the public, and provoking compassionate and intelligent giving," and its the awareness in particular that Marshall hopes to bolster. She plans to have her trip filmed, and she'll also journal about her experiences and share photos; internet pending, she may even release a few dispatches directly from the road. Cat Power will return in time for her birthday, January 21, which doubles as the first night of an in-the-works tour in support of Jukebox. The disc, Chan's second collection of covers, arrives (as you know) the next day via Matador-- now with 100% more Hot Boys! The tour, still coming together, begins in Paris and will whisk Marshall hither and thither worldwide over the ensuing months. As for charity:, you can do your part as well. Marshall points us to the organization's second annual gala benefit, charity: ball, going down December 17 at New York City's Metropolitan Pavilion. A "special live music performance" is promised; gather from that what you will. Once again the three feisty Brazilians known as Bonde do Role have canceled tour dates. The shows that have been nixed were a string of Australian dates in late December and early January. No reason for the cancellations was given, but we imagine the old "exhaustion and illness" could still apply, considering the band's frenzied pace that continued even as they were canceling dates the first time around. Guys, really, it's okay! You can relax for a bit. We don't mind! Sally Shapiro, Johan Agebjorn Cut "Spacer Woman" 12"
Castanets Head West for Tour, Work Up New 7"
Dirty Projectors, White Williams Split a 7"
Dan Deacon Inaugurates Wham City Records With 7"
Radiohead (Sorta) Announce North American Tour! Robyn Announces U.S. Tour Dates! Man Man Adopt Rabbit Habits, Tour U.S.
Evan Farrell (Magnolia Electric Co./Rogue Wave) R.I.P. Country Singer J.D. "Cast" King R.I.P. Thrill Jockey B-Day Bash: Become Yr Fave Album Cover!